Back on St Valentine’s Day the Dotcom walkers visited the Refreshment Room on Carnforth Station which I deemed to be the most romantic place in Lancashire as it was the main location of the British cinema classic "Brief Encounter"filmed in 1945. As we poked around adjacent visitors centre looking at some of the exhibits I began to wonder what it is about this film that makes it one of the most acclaimed films ever made in Britain. Everything that happens in the film is encapsulated in the title which amounts to not very much at all. Following a brief encounter while waiting at a railway station Laura Jesson played by Celia Johnson realises she has developed "feelings" for Alec Harvey played by Trevor Howard and Alec realises he has "feelings" for Laura but both are married so without ever consummating the relationship or getting anywhere near it decide it is best not to see each other again. The film is about the conflict between a person's emotional life and middle class conventions - the middle class conventions win. At the end of the film while the audience feels sympathy for the two protagonists it also feels the right outcome has been reached. Given that the film was made as the war was coming to an end it might be seen as an appeal for the return to normal life with values of civility, decency, duty and restraint after the turbulence of the war years when brief encounters between servicemen on leave and lonely wives and girlfriends were rather more commonplace than we would like to believe. In this second decade of the 21st century we seem a long way away from the Refreshment Room of David Lean's film. What would have Celia made of Big Brother or Trevor of the Jeremy Kyle Show? Not much in the way of civility or decency there and certainly no restraint. 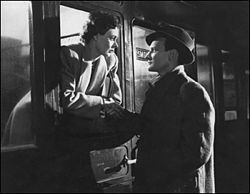 We may have lost things that we needed to lose since 1945 like a colonial empire and measles but "Brief Encounter" with its clipped middle class accents and impeccable manners reminds us of how we British once liked to be seen. WARNING: Follow all advice concerning tides displayed on noticeboards at start of walk. Maps: OS OL Explorer 296 Lancaster, Morecambe and Fleetwood, OS OL Map 7 The English Lakes South-eastern area. 1. With Morecambe Bay on your left walk along the raised embankment northwards. After St Michaels's Lane the embankment ends so continue on the flat reaching Wild Duck Hall a large white building. Keep to the left of the hall on a service road leading to Bolton Holmes Farm. From this point the way is a little less straightforward in that the salt marshes are dissected by creeks and pools which need to be carefully negotiated especially when the tide is high. which brings you to the junction where the Coastal Way turns left. Here keep ahead on Crag Bank Lane passing beneath a pair of railway bridges to a road junction. and continue slightly uphill to the canal bridge. Just before it turn right and following the access path around a children's playground reach the tow path. With the canal on your left walk back to Bolton-le-Sands. This is easy uncomplicated walking. 3. 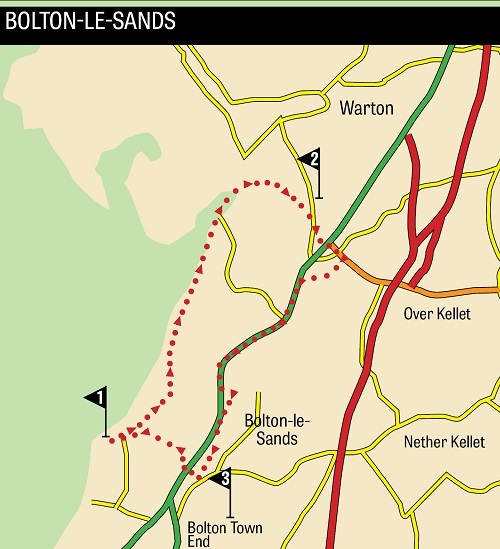 2 ½ miles (about an hour) will bring you back to Bolton-le-Sands. Pass under Church Bridge (No 122) and then take the path up to St Michael's Lane. Turn left and soon after cross the A6. Still on St Michael's Lane continue through a housing estate and to cross the railway by a level crossing. The lane then quickly returns you to the shore and car park.